The time is not specified by the Bible text. I have set this scene in the late morning, as in Scene 01. Sunlight from above illuminates the scene. 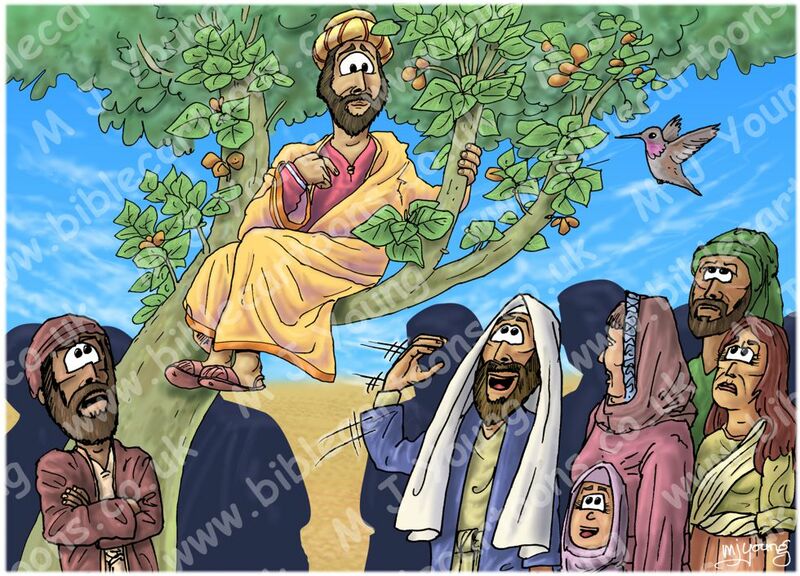 From left to right: an unnamed man, Zacchaeus (up the tree), Jesus the Christ gesturing for him to come down, various unnamed Hebrew people in the crowd. This scene is based on the next page (Scene 04a – Who Me?) but I have added additional figures in the crowd and have represented a background crowd as I have in Scene 0, using dark silhouetted figures. 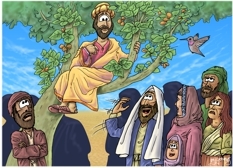 Notice the expressions of the crowd; I was aiming for hostility towards Zacchaeus. He was despised by most people because he was a tax collected for the hated occupying Roman empire. Fortunately Jesus saw faith in him and gave him a second chance to be redeemed…something Zacchaeus jumped at!